Planting drought tolerant perennials is a great way to keep your landscape looking great through sweltering summer heat. And it can help keep watering chores and water bills to a minimum too! When the summer sun starts burning, many plants start to struggle. With too much sun and not enough water, they begin to wither and wilt. For many plants, it can even spell the end of the line. And that is where drought tolerant perennials come to the rescue. 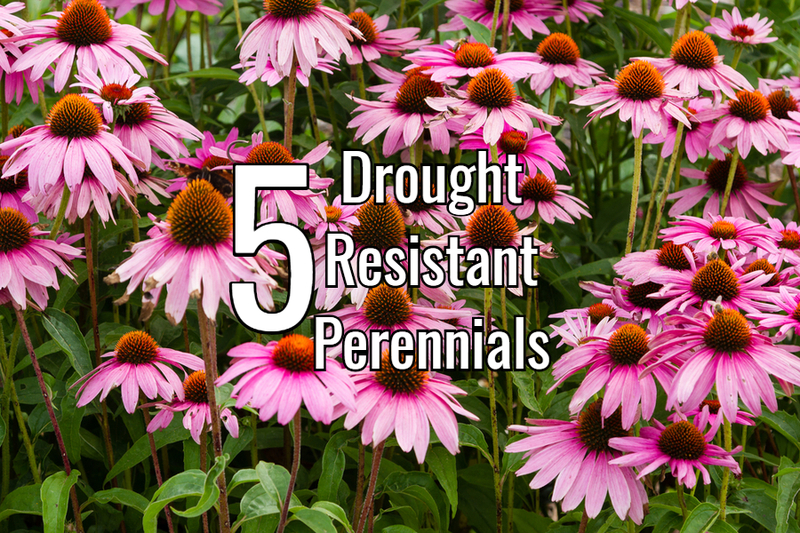 Drought tolerant perennials can stand up to the hottest of conditions. With many varieties, they even thrive in it. Here are 5 of the best of the best at handling summer’s sizzling heat in style. Coreopsis not only looks great, but stands up to the heat! Coneflower : One of the more unique of flowering perennials, coneflowers are an excellent choice when looking for a plant to be both colorful and drought resistant. Coneflowers (pictured at the top of this article) look like somewhat like an inverted daisy. The dark-seeded middle center protrudes up from the petals that form around it. The darkened seed head attracts birds and butterflies wherever its planted. Coneflowers can be found in a variety of colors, from purple, to white, crimson and even tangerine orange. Adding to their allure, they are also deer resistant. A member of the sunflower family, coreopsis is native to the United States. They are known for long-lasting blooms that carry through all summer long, even in the hottest and driest of conditions. Coreopsis is one of the easiest perennials to grow. Much like coneflowers, they are wonderful for attracting birds into the landscape. Perennial Verbena – Perennial Verbena is an excellent drought and heat-resistant plant with blooms that last from late-spring to late fall. Verebena loves the sun and heat, so it can be planted in the sunniest and more arid portions of any landscape. It rarely if ever requires watering. Lantana – Lantana can be grown as a perennial or an annual, depending on where you live. For zones 4-7 they are treated as annuals, and for zones 8 through 11, they can be grown as perennials. They produce beautiful blooms on thick, tough branches that hold up well in the summer sun. Lantana is one of the most drought resistant plants around. It absolutely thrives in full sun, and will stay fresh looking through extended periods of drought. Lantana can add big, long-lasting color to the landscape. Black-eyed Susans, like coreopsis, are a relative of the sunflower, and are highly drought and heat tolerant. They easily stand up to full sun locations, and actually prefer it. Their yellow petals spread out from a dark center seed core, and look much like a miniature sunflower head. Black-eyed susans are wonderful for attracting birds, butterflies and other beneficial insects into the landscape. For more info on perennial plants, be sure to check out our entire page dedicated to them! See : Perennials Page.